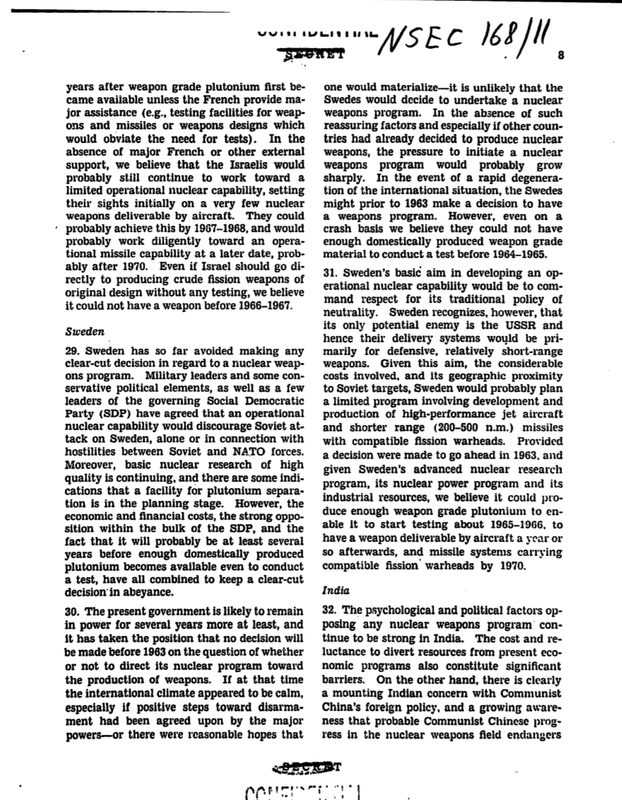 "Each nuclear-weapon State Party to the Treaty undertakes not to transfer to any recipient whatsoever nuclear weapons or other nuclear explosive devices or control over such weapons or explosive devices directly, or indirectly; and not in any way to assist, encourage, or induce any non-nuclear-weapon State to manufacture or otherwise acquire nuclear weapons or other nuclear explosive devices, or control over such weapons or explosive devices. 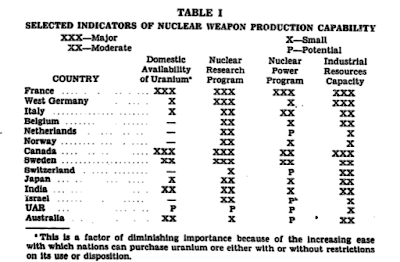 Each State Party to the Treaty undertakes not to provide: (a) source or special fissionable material, or (b) equipment or material especially designed or prepared for the processing, use or production of special fissionable material, to any non-nuclear-weapon State for peaceful purposes, unless the source or special fissionable material shall be subject to the safeguards required by this Article." 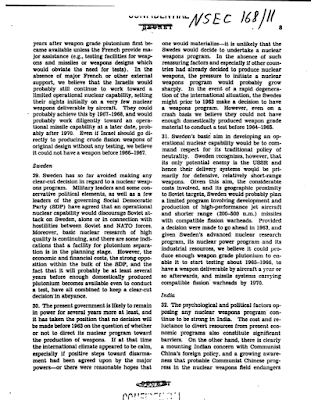 To ensure that states remain compliant with the terms of the Treaty, each signatory must submit to inspections conducted by the International Atomic Energy Agency (IAEA), ensuring that nuclear technology is used for peaceful purposes and that fissile material is not diverted to weapons use. With this background In this two-part posting, I want to look at one of the non-signatories of the NPT; Israel. Given Washington's recent kerfuffle over Iran's supposed movement toward nuclear weapons development, it is interesting to see that one of America's staunchest partners in the Middle East has a highly secret nuclear weapons capability, a long history of prevaricating about its nuclear program and has not signed the NPT. 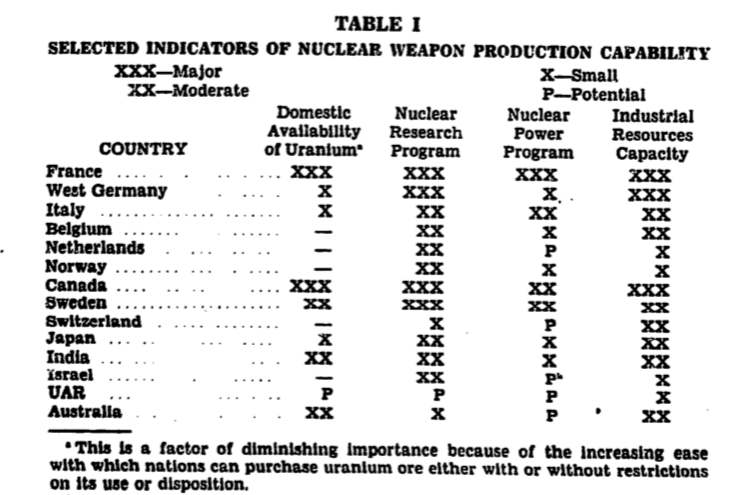 In the first part of this two part posting, we'll start looking back in history and see how Israel developed its nuclear weapons program followed by an assessment of its nuclear capability from various sources that are believed to be reliable. 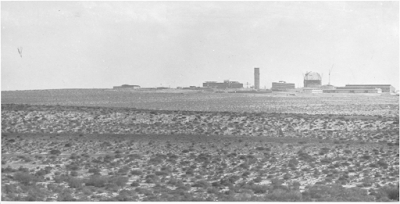 1948 - Israeli scientists began to explore the Negev Desert for uranium deposits on the orders of the Israeli Ministry of Defense, discovering low grade despotic near both Sidon and Beersheba. 1949 - the newly created Weizmann Institute of Science actively supported nuclear research by funding the postgraduate educations of Israeli scientists who were to become the foundation of Israel's nuclear weapons program. 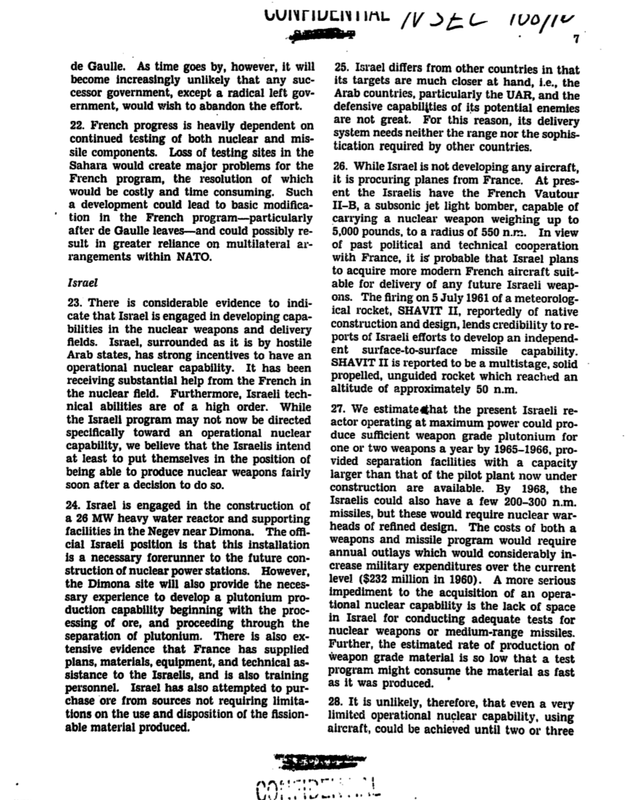 This is followed by a joint project between Israel and France led by Francis Perrin, a nuclear physicist from the French Atomic Energy Commission. Late 1940s and early 1950s - the United States Department of Defense and the National Institutes of Health provided financial support to the Weizmann Institute of Science for defence-related projects. 1952 - Israel secretly funds the Israeli Atomic Energy Commission (IAEC) under the control of the Israeli Defense Ministry. 1953 - Israeli scientists develop a uranium extraction process and develop a new process for manufacturing heavy water. A formal agreement on co-operation between France and Israel in nuclear research is signed. 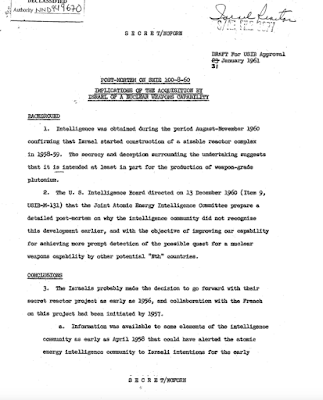 President Dwight Eisenhower announces the "Atoms for Peace" program which leads to the construction of the Nachal Soreq light water research reactor. 1955 to 1960 - 56 Israelis receive training at the United States Atomic Energy Commission research centres under the Atoms for Peace program. 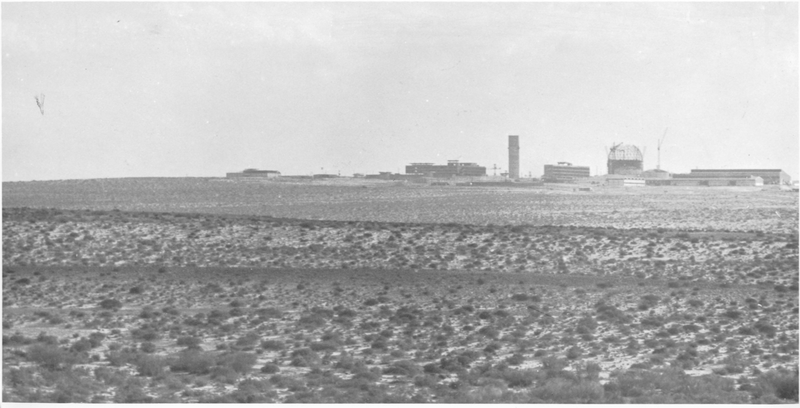 1956 - France agrees to provide Israel with a 24 thermal megawatt natural uranium reactor. This is later upgraded to a large plutonium processing reactor. "Part of the puzzle about the textile plant cover story is how it came about. While we know that Addy Cohen, the director of the Foreign Aid Office at the Treasury Ministry, used that description when guiding U.S. Ambassador Ogden Reid and some of his staff on a helicopter tour of the Negev in September 1960, the documentary trail has it limits. Cohen, who has just turned 87, and is living outside Tel Aviv, recalls the episode vividly. In a series of written and oral exchanges with the editors of this e-book in recent weeks, he has clarified further what happened. 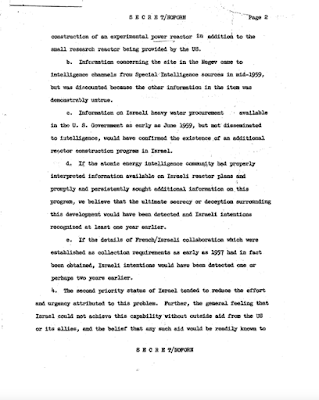 As a senior official, Cohen was aware of the Dimona project and of its utmost secrecy. The issue of Dimona "was discussed in one of the Treasury Ministry executive meetings under [Minister Levi] Eshkol," he wrote us. The helicopter tour covered various development projects that the U.S. supported, and they were on their way from the Dead Sea. 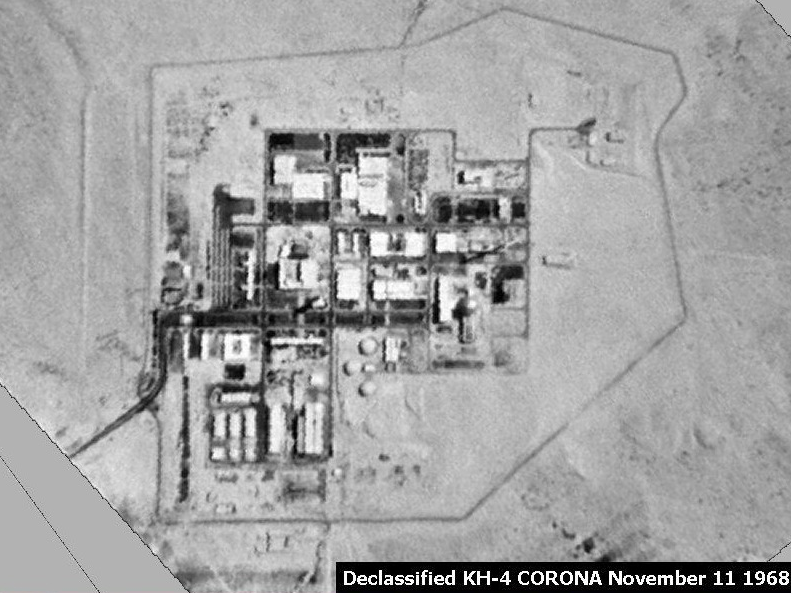 "I was not prepared to Ambassador Reid's question [about the Dimona site] as we flew far north of the structure. I ad libbed by referring to Trostler, the Jerusalemite architect [a relative of Cohen's wife], who actually designed a textile plants" at Dimona. Surprised by Reid's query, Cohen improvised an answer that was not completely false. In retrospect, as he wrote on March 5, 2015, "It may have transpired that I was the first one who referred to the project as a 'textile plant' but I can assure you that it was not planned."" 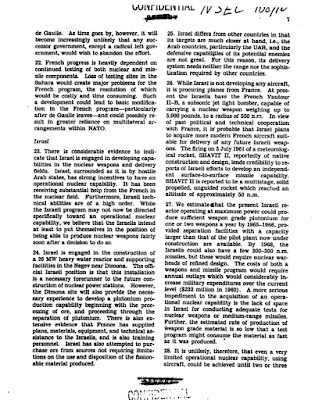 In late 1957, Israel signs a formal agreement with France for construction of the Dimona nuclear facility which will only be used for "scientific research". Construction of the Dimona complex begins in early 1958. 1960 - France terminates nuclear assistance to Israel before the Dimona complex construction is completed. After negotiations, France agrees to proceed with construction as long as the complex is not used to pursue a nuclear weapons project and that Israel announces the existence of the facility to the world. 1960 to 1965 - Construction of the Dimona reactor proceeds. France may have helped Israel design and detonate its own nuclear device at its proving grounds in Algeria. The United States provides Israel with 50 kilograms of 90 percent U-235, a quantity sufficient to manufacture several bombs. On February 13, 1960, France tests its first nuclear weapon, allowing Israeli scientists unrestricted access to data from the test explosion. 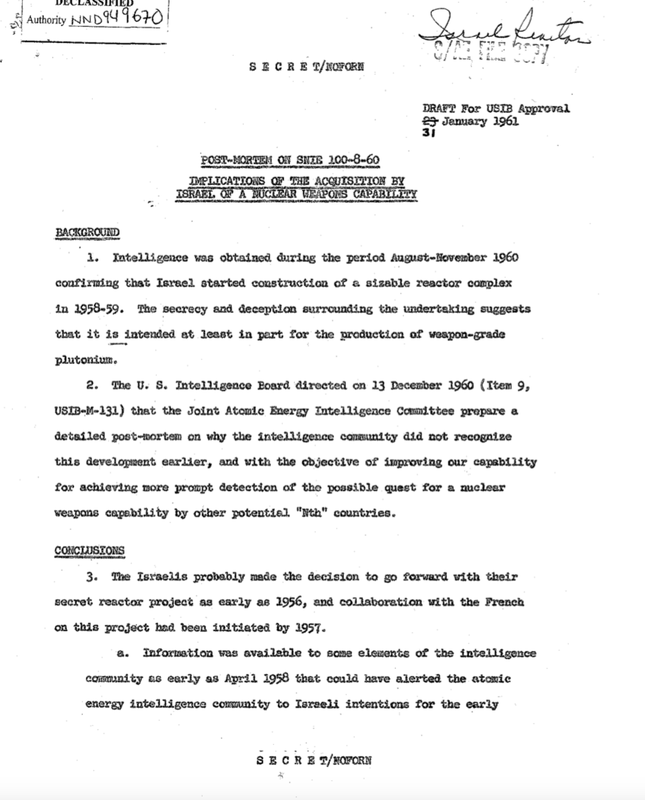 During mid-1960, the Central Intelligence Agency warns President Eisenhower that the Dimona complex has the potential to produce 1.2 nuclear weapons per year. 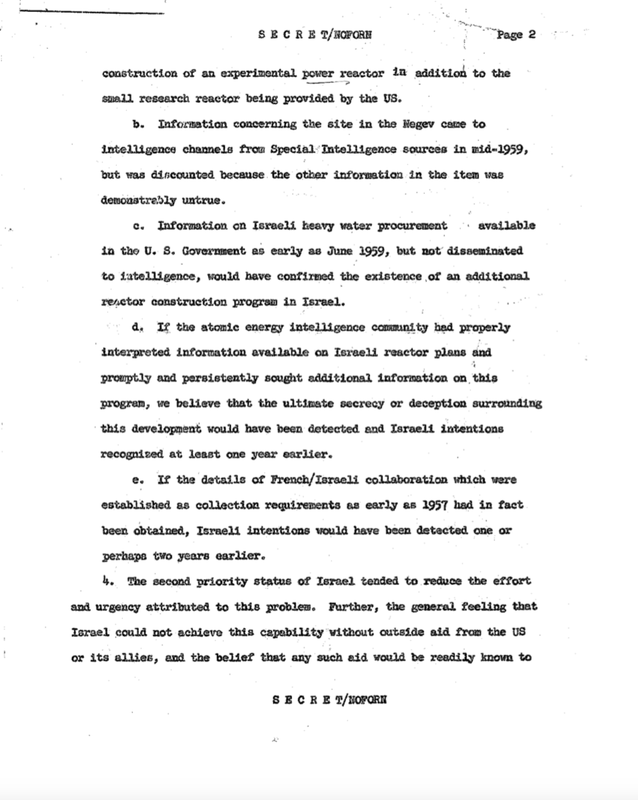 On December 2, 1960, the United States Department of State announces Israel's secret nuclear installation. 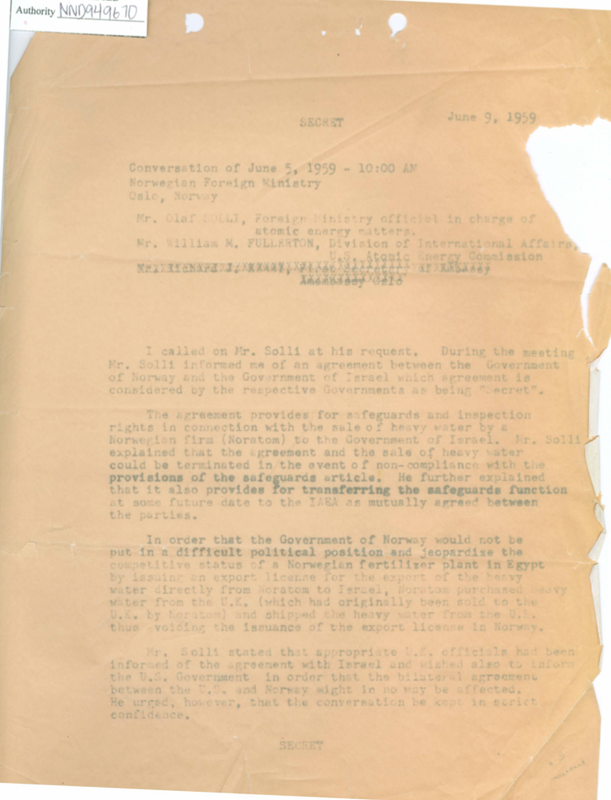 On December 21, 1960, Israeli Prime Minister David Ben Gurion informs the Knesset that no bombs are being built and that the Dimona complex is "designed exclusively for peaceful purposes". 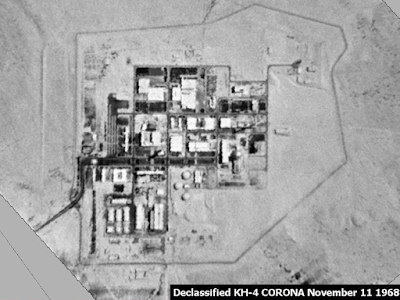 Between 1962 and 1969, an agreement struck between Israel and the United States allows American inspection teams access to the Dimona complex twice annually, however, the inspection teams see little of the facility and none of the underground portions which are hidden by Israeli agents. "The President, Feldman (the President's Deputy Special Counsel and advisor on Jewish affairs) said, took the opportunity to say that the United States is very very concerned about any proliferation of nuclear weapons and that he, the President, would strongly hope that Israel would not develop or obtain this kind of weaponry. In reply Feldman said that Peres had given an unequivocal assurance that Israel would not do anything in this field unless it finds that other countries in the area are involved in it. "I can tell you clearly that we shall not be the ones to introduce nuclear weapons into the area. We will not be the first to do so." 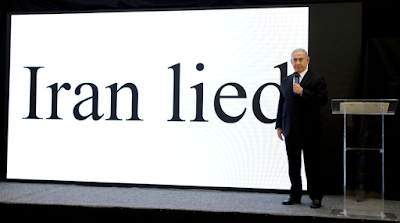 This was the beginning of Israel's policy of nuclear ambiguity which left a lack of certainty among its enemies and the rest of the world, particularly the United States, regarding Israel's nuclear weapons capabilities. From what we can see from the early history of Israel's nuclear weapons program, it appears that it takes a liar to know a liar. In part 2 of this posting, I will take a look at more recent developments in Israel's quest for nuclear weapons and examine various assessments of its current capabilities, information that is particularly pertinent given Washington's fist-shaking at both Iran and North Korea's nuclear weapons programs/alleged programs. Israel needs to be bombed to dust before it can use these weapons. An illegal state with nuclear bombs is a terror state.